The cold is starting to set in and winter is beginning to show its true face. To some, this time of year means bundling up and waiting out the season indoors, but we're a bit optimistic here at Bryant Park. 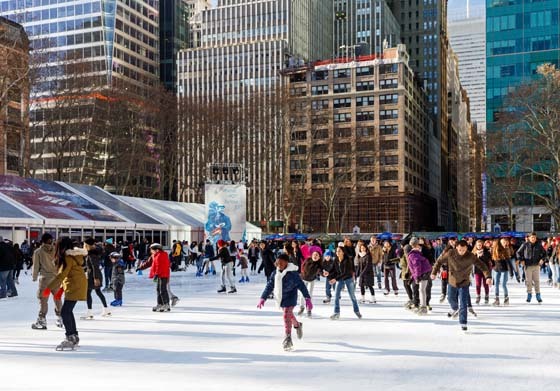 The days are getting longer and we've got tons of activities and events to keep you busy at Bank of America Winter Village at Bryant Park. 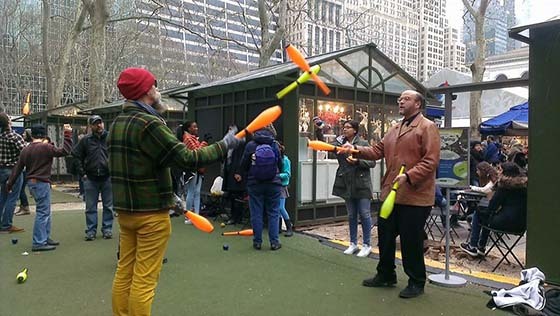 The Bryant Park jugglers are here year-round. Find a fun and communal break from the tedium of work and winter and learn a new skill at the same time. You're sure to make new friends with the enthusiastic instructors and regulars. Everyone is welcome regardless of experience level. You'll find them every day at The Green by 41st Street and Sixth Ave. Check out the jugglers' blog to find out what you're getting into. Extra layers and frozen fingers make this experience more challenging, but even more rewarding when you're impressing friends and passers by with your skills. Photo via Jacob Alex Dyer. 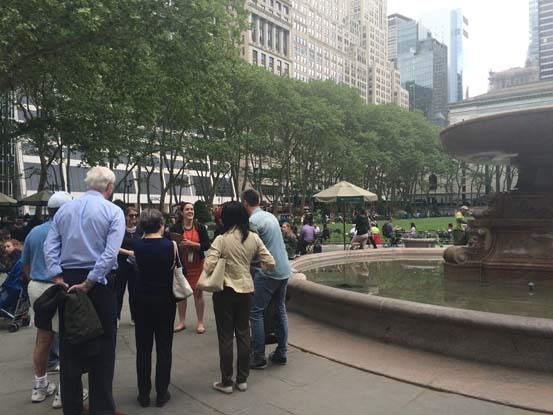 Longing for the days of Bryant Park Reading Room events? Not to fear, our poetry series has merely sought shelter from the cold across the street at the cozy Kinokuniya Bookstore. 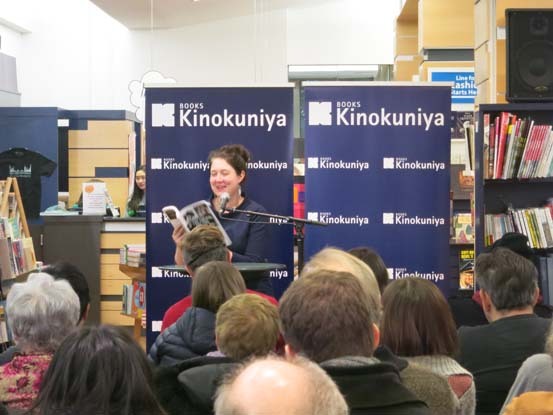 Every third Tuesday of the month from now until April, Kinokuniya will be hosting intimate poetry readings that are sure to warm your heart. Stop by on Tuesday January, 19th at 6pm for an event featuring the poets of Ugly Duckling Presse. Poets from Graywolf Press featured new works in our 2014 Winter Word for Word series. Join The Rise NYC, a community-driven pop-up fitness group, for a free boot camp every Wednesday of the month. The rotation of exercises, a mixture of cardio and strength training, is the perfect incentive to keep up that New Year's resolution. No equipment is necessary and sessions will be rain or shine. From now until January 6th, Fit Club meets on the Fifth Avenue Terrace in front of the New York Public Library. From January 13th on, boot camp will see a triumphant return to the Fountain Terrace on Sixth Avenue. Make new friends and build mutual accountability with this free series. Communal crunches couldn't be more inciting. Photo via The Rise NYC. Ever wonder how Bryant Park became such a vibrant public space amidst all the skyscrapers and concrete? Join our knowledgeable tour guides for free public tours every Wednesday at 11am near the Fountain for an insightful tour focusing on urban preservation and restoration. Advanced registration is required. Think the Josephine Shaw Lowell Fountain is a cool water feature? In a past life Bryant Park played home to the Croton Reservoir which held 20 million gallons of New York City's drinking water. Winter Village mainstay, The Rink, continues to operate for another two months of skating and merriment. Admission is free, so you wont break the bank as you practice your pirouettes. Open until March 6th, group reservations and skate lessons can also be arranged. Impress your friends. Bryant Park is one of NYC's most Instagramed locations (Just please no phones on the ice.) Photo by Colin Miller Photography. While the Holiday Shops have moved out for the season, food options are still plentiful in the park. Stop by Celsius for a scenic meal overlooking The Rink, or at the Bryant Park Grill for new-American fare in an intimate setting. The Southwest Porch offers a chance to eat and people watch in this open air/heat lamp heavy restaurant. Low on time and need a quick meal? 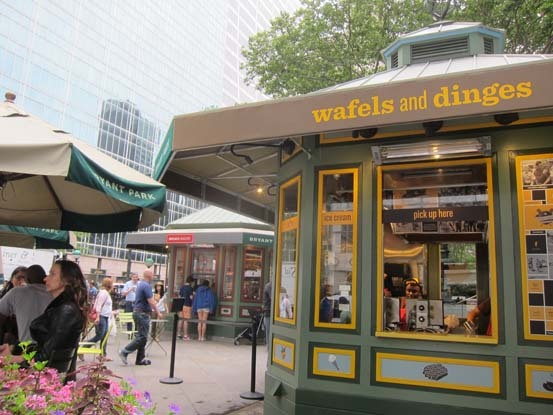 We've got you covered with Ice Bites and the food kiosks; Breads Bakery, Le Pain Quotidian, Wafels and Dinges, and Coffeed. Perfect for you to grab and go enjoy more of the park! Our movable outdoor seating allows you to sit and enjoy your meal from any part of the park you'd like. While this is just a small taste of some of our on-going activities, be on the lookout for info on some of our special events, including the return of Winter Carnival, and the Pond Hockey Classic.